An iconic landmark in the city, this cylindrical high-rise towers over the Raval neighborhood like a beacon, beckoning one and all to come to its many, many parties. Young and vibrant, the sceney spot is all about having a good time and that goes from the DJ-led brunches to the graffitied walls, to the avant-garde design throughout. A friendly staff is there to guide you to everything this hotel has to offer both day and night – and that’s an energetic vibe unlike most hotels in the city. One of the nice things about the rooms is your ability to personalize them. What does that mean? Next to the bed are a couple of menus. One is for the room’s scent and the other for the pillows. Scents include grapefruit, green tea, and berries, while pillows come in very firm, latex, feather mix and others. The rooms themselves are on the small side with open concepts where the bathroom sink divides it in two. White floors and pink walls aren’t uncommon and massive views are exceptional from the higher floors. All rooms come with free Nespresso. Just check the pods so you’re not stuck with all decaf – yuck. The open bathrooms will inspire the frisky in all of you, though the shower does have strategically placed frosted glass. Soft robes and slippers are standard, as are The White Company bath products. 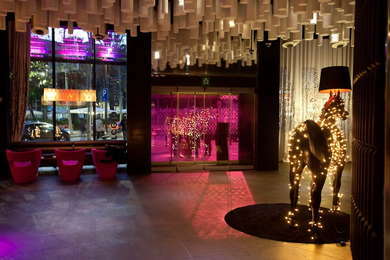 Prepare to be wowed upon entry to the hotel as hundreds of white cones hang from the ceiling while you’re greeted by a life-size black horse with a working lamp on its head. Lounge seating circles around a main column, following the shape of the entire building where you can take selfies with an afro’d party chick in a slinky cocktail dress drinking a martini (signs of things to come). Black communal tables hold multiple Mac computers and oversized Alice in Wonderland style lamps. A welcome glass of cava is also standard to get you right in the mood here. The small rooftop pool is surrounded by gray beanbag chairs and sports amazing views of the city. A bar is off to the side. There’s a single massage room and a dry sauna for when you need to sweat out last night’s party. There’s no full spa but you can get in-room treatments. The gym is open 24/7 and has black rubber floors, free weights, and Technogym machines. It feels more like a club than a gym as it’s pretty dark in here – but that’s sorta the vibe of the whole place. The B Lounge is the hotel’s main eatery and can be found on the lobby floor in a circular expanse with gray banquettes and lots of windows looking onto the streets. Menus come in vinyl record jackets and cuisine is a mix of tapas and casual dining options. The breakfast is also served here and consists of a minimal buffet with a range of healthy and not-so-healthy items. On Sundays, the B Lounge becomes a party as DJs spin from noon to 3:30 pm. The rooftop is dubbed the 360° Terrace (and rightfully so) as it spins around the entire roof providing guests with epic vantage points. DJs play dance tunes up here every night of the week as booze flows freely. YOU SHOULD KNOW If you’re staying on the top floor, you’ll probably hear the DJ’s bass late into the night. Just an FYI. Also, the bar is closed on the roof in January and February. The Raval neighborhood is chock-full of bars, lounges, restaurants, and attractions and most things are walkable. If walking isn’t your thing, you can always hit up the metro as the Liceu stop is only 5-minutes away (though you’ll have to walk to that). Careful in some of the areas around the hotel as certain alleys can be a little dodgy at night. Do you like Neapolitan pizza? If you crave that authentic crust, you’ll find the best of the best at Frankie Gallo Cha Cha Cha (4-minute walk). If you’re indecisive, you have endless options at La Boqueria (5-minute walk), an open market with dozens of food stalls and restaurants with all types of cuisine. The hotel was pretty much made for drinking, but if you require something different with excellent cocktails, check out the super chill Bar Marsella (2-minute walk). If you want to try a place that’s both weird and filled with booze, head to El Bosc de la Fades (11-minute walk) where creepy mannequins will watch you swill with your friends. If you like to party and want non-stop action out of your hotel, then you’ve come to the right place. From the moment you enter, you’ll see that this accommodation is designed for a young clientele who wants to drink, play, and flirt during their stay in Barcelona. The rooftop is really the top spot (no pun intended) with incredible vistas and nightly DJs next to a small pool. If you need detox options like a full spa- you won’t get that here, but there is a gym and sauna. Location-wise, you’re pretty central and can walk to most things in the city, which gives this party hotel an added bonus.